A peripherally inserted central catheter (PICC) infection occurs when bacteria enters the bloodstream through or around a central line catheter . 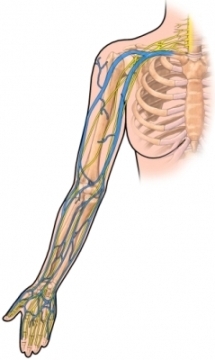 A PICC is a long, thin tube that is inserted through a vein in the arm. The catheter is threaded through the arm vein until it reaches a larger vein close to the heart. Commonly called a PICC line, it is used to deliver medication, nutrition, IV fluids, and chemotherapy . If bacteria start to grow on the central line catheter , they can easily enter the blood and cause a serious infection. This can lead to a condition called sepsis , which occurs when bacteria overwhelm the body. Bacteria normally live on the skin. Since the catheter is inserted through your skin, these bacteria will sometimes track along the outside of the catheter. From the catheter, they can get into your bloodstream. Antibiotics—Antibiotics are medications used to treat an infection. The kind of antibiotic you will be given depends on which bacteria is found in your blood. Central line care—Often, the PICC line will need to be removed and replaced by a new catheter. When you are getting a PICC line placed, the staff will take steps to reduce your risk of infection. Ask the staff to take every precaution to prevent an infection. Tell the staff right away if the bandage needs to be changed or if the site is red or sore. Ask everyone entering your hospital room to wash their hands. Do not allow visitors to touch your catheter. Follow all instructions concerning your PICC line. Before touching the catheter, wash your hands or use a hand sanitizer. Wear gloves when touching the area. Wash the catheter caps with an antiseptic. Do not allow anyone to touch the catheter or the tube. Check the insertion site daily for signs of infection, such as redness or pain. Central line-associated bloodstream infection (CLABSI). Centers for Disease Control and Prevention website. Available at: https://www.cdc.gov/HAI/bsi/bsi.html. Updated March 1, 2016. Accessed March 2, 2018. Central venous catheter. EBSCO DynaMed Plus website. Available at: http://www.dynamed.com/topics/dmp~AN~T146372/Central-venous-catheter . Updated October 25, 2017. Accessed March 2, 2018. Central venous catheter. American Thoracic Society website. Available at: https://www.thoracic.org/patients/patient-resources/resources/central-venous-catheter.pdf. Accessed March 2, 2018. Marschall J, Mermel LA, Fakih M, et al. Strategies to prevent central line-associated bloodstream infections in acute care hospitals: 2014 update. Infect Control Hosp Epidemiol. 2014;25 Suppl 2:S89-S107.